Don't just do something; stand there! "Holy crap," texted a friend of mine, "Dow futures are down almost 800 points. We might never recover from this." It was the night of November 8, 2016. Folks who spend too much time worrying about money considered a bleak future. My friend wasn't alone. Paul Krugman of the New York Times said, "If the question is when markets will recover, a first-pass answer is never." As we went to sleep, a certain portion of America was deathly afraid of what tomorrow would bring on Wall Street. But then the sun came up. People went about their daily lives. And oh yeah, the Dow not only erased that huge loss from the night before, it surged to all-time highs...and has continued doing so to this day. The worst thing investors can do right now is to dramatically -- or mindlessly -- change their investing approach. In 1992, many thought that a Clinton presidency would be a death knell for pharmaceutical stocks. 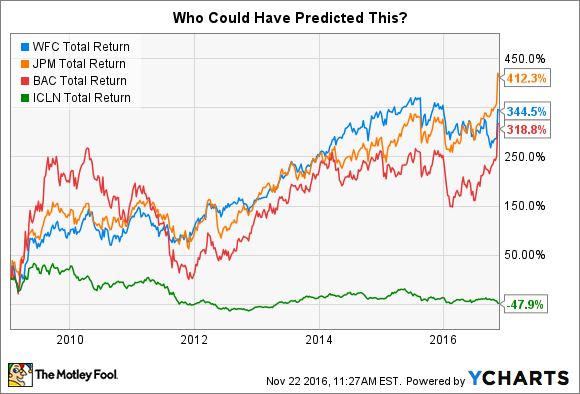 Over the next eight years Pfizer, Amgen, and Johnson & Johnson returned 791%, 611%, and 385%, respectively -- spanking the market's overall return of 251%. In 1994, analysts thought cigarette companies scored a big win with Republicans gaining control of Congress. Despite a belief that it wouldn't happen, regulation of the industry still surfaced, and returns of what is now Altria -- the nation's largest tobacco company -- were only one-fourth what the broader market returned over the next six years. In 2000, pundits claimed that bank, pharmaceutical, and airline stocks would all benefit from a Bush presidency. But by the end of his term, the KBW Nasdaq Bank Index was down 80%, the NYSE Arca Pharmaceutical Index was down 50%, and four of the six largest U.S. airlines were out of business. The bottom green line is for the iShares Global Clean Energy ETF. The other three are Wells Fargo, JPMorgan Chase, and Citigroup. In his best-selling book The Black Swan, author and trader Nassim Taleb wrote, "Prediction, not narration, is the real test of our understanding of the world." If we accept that as true, then we have to admit that our understanding of the world is truly broken. Here's the insidious part, as stated by Morgan Housel: "The most important point here is that all of these predictions made sense. They seem rational. They're not fanatical partisan cries, or angry rhetoric. But all of them were wrong." We all have a huge blind spot when it comes to predictions -- whether they be about the economy, our love lives, or the fate of our favorite sports team: We love stories. Under certain scenarios -- namely, when it involves a set of variables that you have control over -- stories are very healthy constructs. If you got fired from a job, and are able to see how it could lead you to a better future -- say, pursuing that dream career that you once were afraid to chase after -- your story is a catalyst for positive life change that is under your control. But when you start to formulate stories about things you have absolutely no control over -- like the stock market, the economy, or the ways that other people should think or behave -- you are setting yourself up for utter disaster. Financial fortitude: companies that have lots of cash and lots of customers. One customer leaving won't be back-breaking, and having cash gives the company options in tough times. Skin in the game: companies where management and personnel have just as much incentive for long-term quality as I -- a long-term investor -- do. This often means finding (1) founder-led companies with crystal-clear mission statements, (2) management teams that own lots of stock, and (3) employees who are engaged and enjoy working at the company. A barbell approach: companies that mix a very large, stable core business with smaller, more speculative ventures. Let's use Alphabet as an example. On the safe side, Alphabet has a huge moat surrounding its core business: over 1 billion people use seven different Google products. On the speculative side, the company's Google X laboratory is taking moonshots on technologies that could change the world. By taking this approach, I'm largely immune to the political winds of the day, and I sleep pretty well at night. As I have no control over the stock market, it also removes any hint of a narrative from my approach. To be clear, I'm not saying that politics is unimportant to what happens in the economy, rather that it's not all-important. And even if it was all-important, the idea that we can predict what will happen is demonstrably silly. If you want a simple step to a higher form of life, as distant from the animal as you can get, then you may have to ... shut down the television set, minimize time spent reading newspapers, ignore the blogs. Train your reasoning abilities to control your decisions. ... Train yourself to spot the difference between the sensational and the empirical. This insulation from the toxicity of the world will have an additional benefit: it will improve your well-being.